From the hill came a staccato sound I’d heard in Scotland, in Shropshire, in Slovakia, in Spain. It was faint at first. Toc-toc, toc-toc, toc, toc, toc, toc. My pulse quickened as the tapping came closer. Toc, Toc, Toc. “It sounds like chopsticks,” said Ben Hardy, grasping a Hussey pigeon gun and scanning the skies above the hill in front of us. Then, through the trees that crowned the ridge, came the muffled clatter of pheasants flushing. Hardy’s posture tightened; he glanced back and forth, searching for a flash of wings through the foliage. There! To the right, over another shooter, a bird appeared above the trees, wings locked—a rooster trailing his tail and skidding in the crosswind. He was high . . . really high. The shooter below was armed with a smallbore, and he fired once, then again. The bird sped on untouched. Then another rooster came cackling over the oaks and evergreens, and another—almost “archangels,” as the British call tall pheasants. 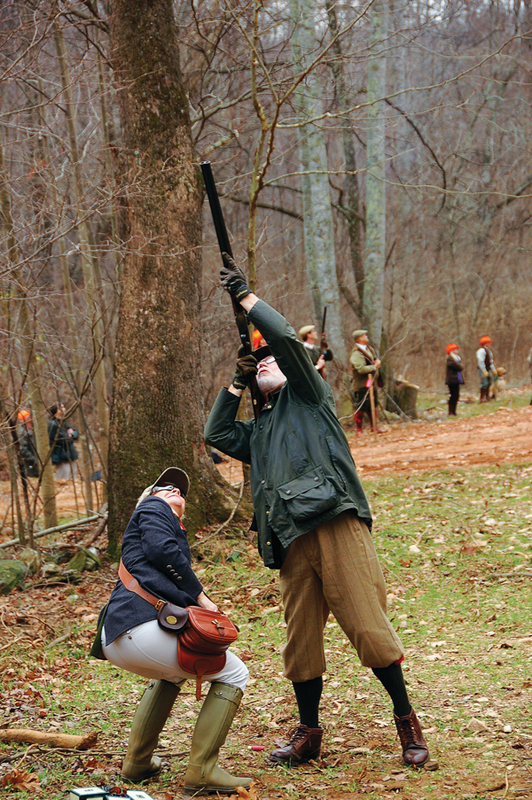 Virginia’s 12,000-acre Primland resort was host to Holland & Holland’s first driven shoot held in America. Down the line muzzles rose to address birds as the pheasants topped the trees, a few of them clapping for height but most streaking over the shooters on set wings and picking up speed as they sailed for safety over a pond behind. Next came the boom of guns in the valley, the schnick of ejectors, the sound of pheasants splashing, Labs retrieving, laughter, cheers, groans, the odd oath—and still the steady toc, toc, toc of beaters unseen in the woods tapping sticks and driving birds our way until a blast from a bullhorn signaled the drive’s end. That you’d expect a good showing when London gunmaker Holland & Holland hosts a shoot stands without saying; surprising, though, was the location—not Scotland, or Shropshire, or Devon, or the wooly hills of Wales, but in the mountains of southwest Virginia. 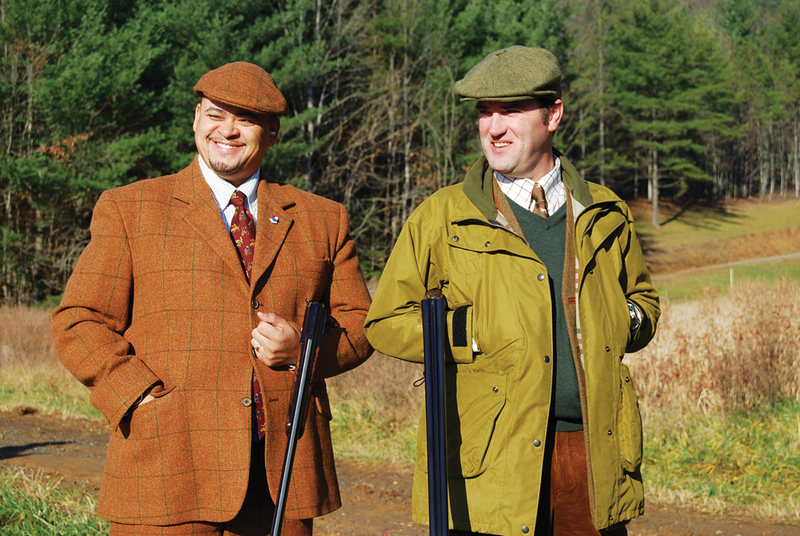 Last December H&H held its first-ever driven shoot in America. Guy’s and David’s plan was simple: Find a good shoot with accommodations to match, gather like-minded folks, bring lots of Holland guns to try and test, shoot game and clays galore for three days, eat, drink (after shooting) and be merry—essentially capture the ambience and atmosphere of a weekend English shooting party. Everyone has a grand time and goes home happy—maybe even with a new Holland gun on order. One obstacle they encountered is that good driven-game shooting isn’t readily found in America. Let’s exclude from the get-go the ersatz imitations: “Continental Shoots” where caged birds are released from towers or elevated platforms to a circle of surrounding Guns. Proper driven shooting—where wild or semi-wild free-range game is driven over Guns by teams of beaters directed by a gamekeeper—is quite rare in the States. Yes, there are some billionaires with private shoots and several commercial operations—notably Blixt & Company’s well-regarded ranch in Idaho—but predator-protection policies make Old World game husbandry virtually impossible in the US, and consequently driven shooting is the exception rather than the rule. Virginia’s Primland offers one of those exceptions. 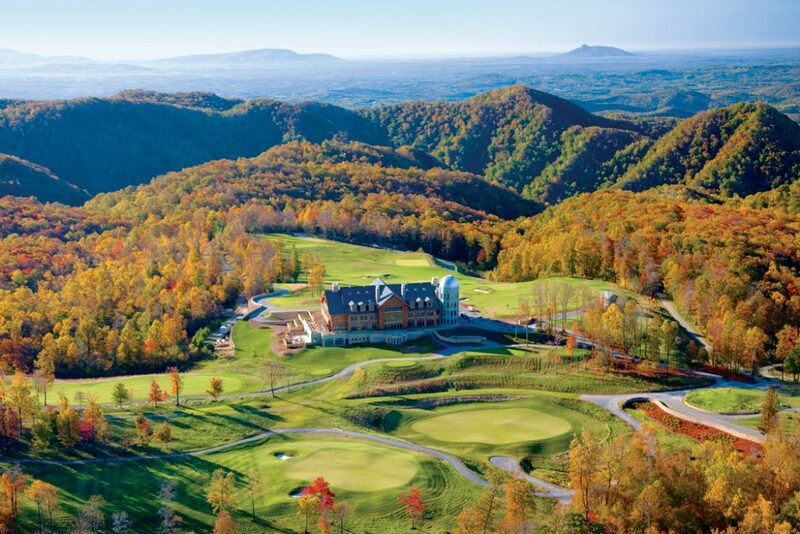 The Blue Ridge Mountain resort has had a driven-style shooting program in place for more than 20 years, begun at the behest of its late Swiss-French billionaire owner Didier Primat. Driven shooting was at first a private affair for the Primat family (which still owns the resort), but it gradually has become commercial as the resort has expanded. Today about 20 days of driven shooting per year are on offer. Given easy airport connections from H&H’s American base in New York and other major cities, Primland was seemingly a sensible choice; but one question nagged: Could a sporting resort on this side of the Atlantic offer driven shooting to the standards expected by one of the world’s greatest gunmakers? On paper Primland—which at 12,000 acres, in the words of one observer, “is just a tad smaller than Bermuda”—appears to offer it all. Its 7,000-yard, par-72 Highlands Course has won a slew of accolades from prestigious golf publications; its rugged hills and forested gorges are veined with more than a hundred miles of horse, hiking, mountain bike and ATV trails; the nearby Dan River and feeder streams teem with trout; and its new 72,000-square-foot mountaintop lodge provides not only luxurious accommodations and gourmet fare but also panoramic views of Blue Ridge vistas. The shooting sports have been at the core of Primland’s existence since Didier Primat purchased the property in the 1970s. 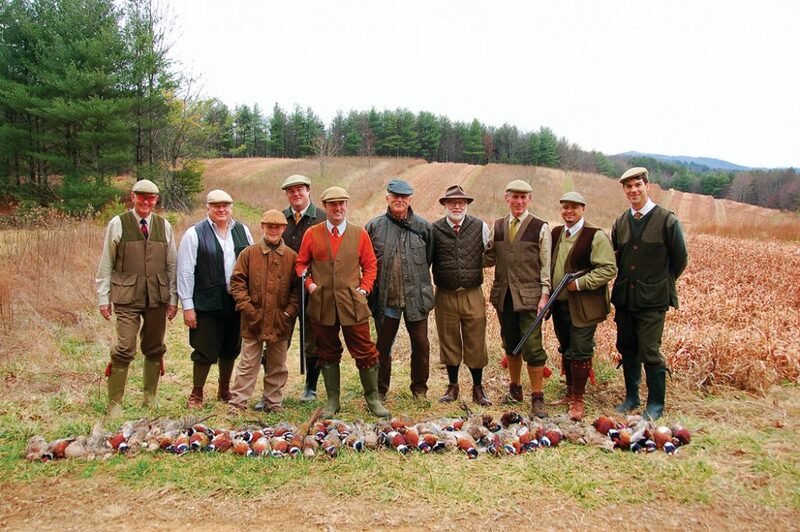 Sporting clays, deer hunting and turkey hunting are attractions, but Primland’s bread-and-butter has been upland shooting over dogs for quail, chukar and, especially, pheasants. The hunting has been good enough to earn an Orvis endorsement. 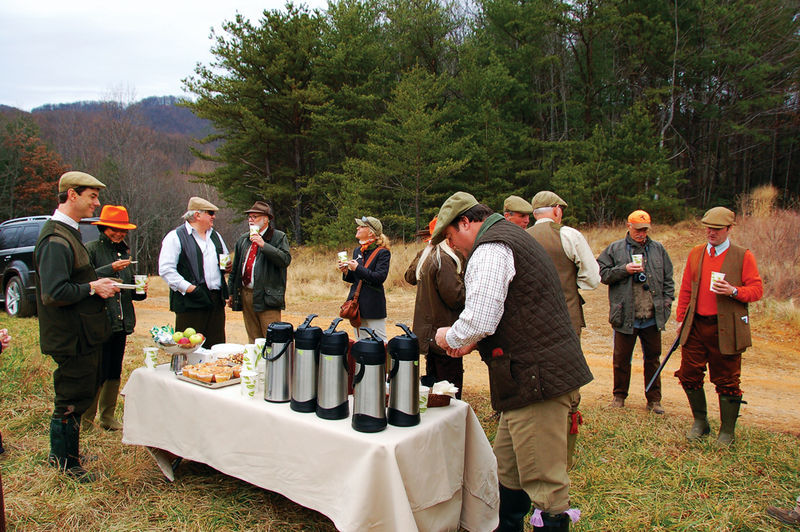 Driven-type shooting—what Primland calls its European-Style Shoots—is becoming increasingly popular. I arrived at Primland to December-gray skies and drizzling rain to meet Guy and David and their team of shooters. The weather had proved no obstacle to a British firm that has for the past century and a half crafted guns for precisely such conditions. Since English shooting attire was the order of the day, I tugged on my Wellies and donned a flat cap and joined the line of Guns at the base of a hill for some “simulated driven”—oncoming clays launched by a battery of traps hidden on the hilltop. David, who hails from New York City and describes himself as “the only Puerto Rican in the British gun trade,” handed me a Holland Royal over/under and stood behind me to load. Then the clays came—on, and on, and on—and I shot them until the gun was smoking in the rain. The Royal, like its sister side-by-side of the same name, is a sidelock built to exquisite standards. The pair of craftsmen charged with designing it in the early ’90s once told me that they were instructed to make it “as beautiful as a Boss and as reliable as a Browning.” By all accounts they succeeded. The Royal’s modern ejector system is a substantive improvement on older British designs, and its action is drop-dead gorgeous with Holland’s trademark serpentine bolsters. It is now Holland’s best-selling gun in America (and most expensive, starting out at just less than $120,000), and it is a magnificent example of contemporary “best”-quality gunmaking. With rain falling and dusk arriving early, we retired to the lodge—which despite its size has only 26 suites and guest rooms. Completed in 2009, the lodge marries the clean, spare elegance of modern northern European architectural design with the material sensibilities of the southern Appalachians—chestnut and hardwoods reclaimed from area barns, for example, and stone from local hillsides. Aboriginal art from the Primat family collection hangs on the walls. It sounds cliché, but the effect is opulence without ostentation. Around the dinner table that evening our team of eight Guns and wives became fast friends, dining on the likes of risotto with local wild mushrooms, Virginia-raised Border Springs Farm lamb in brown butter and capers, and a mouth-watering mountain-berry torte. A glass or two (or was it three?) of port, and all went to bed happy and sated—although I wondered how well, when the bleary-eyed morning came, the first day of driven would come off. I would not describe myself as an expert driven shooter, but I have done enough of it abroad to have seen it great, good and, on more than one occasion, dreadful. For the Guns driven shooting is not a test of field craft but rather a challenge of marksmanship and poise (everyone is watching you). For the gamekeeper and his army of beaters each drive is a new battle to bring the birds over the line in such a way to provide sporting shots to everyone as regularly as possible and for as long as the drive lasts. Gremlins abound to confound a gamekeeper: The wind can change and the bulk of birds can zip back over the beaters, the birds can scoot out the sides of the beating line and escape, or the birds can scurry forward until the very end and rise in one cacophonous flush—the so-called “royal flush”—which is exciting for the 10 seconds it lasts but provides no sustained shooting. Most problematic are low birds, which are simply unsporting and are especially common in flat terrain. But Primland isn’t flat. Perched at 3,000 feet on the eastern flank of Virginia’s Blue Ridge, the resort’s sprawling forests are bisected by gorges and valleys—and it was in the bottom of one of those valleys where we began the day’s shoot under overcast but dry skies. I had drawn a peg in the center of the line—a spot at the base of a hill that broke left and right. David handed me one of Holland’s over/under Sporters, the firm’s Anglicized, Italian-inspired detachable-triggerplate gun. It was beautifully balanced and a little heavier than the Royal. “It’s perfect for pheasants,” he said. I looked up the hill, and then to the bare-branched oaks on it over which the pheasants would stream. Shooters stood in English attire, a loader from Primland attending each. Behind the line were pickers-up with Labs on leashes. But for the loaders’ hunter-orange hats, it could have been a steep-sided drive in Wales. In the distance gamekeeper Steve Nester sounded his horn. The woods grew silent, and chatter among the Guns fell to whispers. I stamped my feet and pretended I wasn’t nervous. Then, drifting through the woods, came the tapping toc, toc, toc and soon after the sound of birds on the wing. The drive was what I had hoped for and more—it was, in fact, startlingly good. There were a handful of low-flying birds, but most came out over and through the trees at heights and speeds sporting enough to more than test the line. I missed plenty with my usual aplomb—despite the lovely gun in my hands—and loved every minute of it. hilly terrain with great skill to present pheasants to test a line of Guns. Later on I spoke to Nester, who grew up nearby and has worked for the Primat family for more than three decades. In 1987 he was sent to train as a keeper at the Primats’ UK shooting estate in Shropshire, and he spent nearly a year there learning the tricks of the trade. Back home that has translated into placing cropfields in strategic locations around each of Primland’s dozen drives, managing the food and cover planted in them, and using sewelling (a cloth fence) and other man-made barriers that encourage birds to take flight so that they are fast and high when they break the line. A century ago, for an American to shoot driven game with a best gun he would have had to board an ocean liner for weeks of travel across the Atlantic. These days for the pheasants of Primland you needn’t even leave the country. 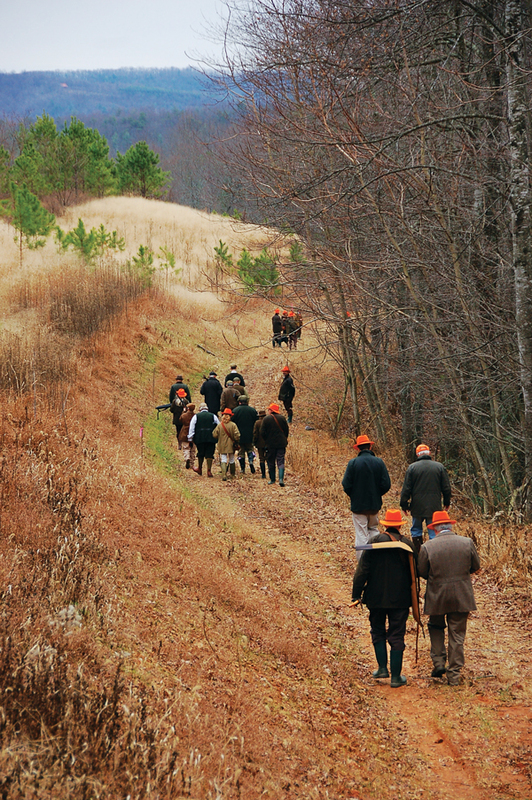 For more information on driven pheasant shooting, contact Primland, 866-960-7746. For information on best guns or driven shooting, contact Holland & Holland, 212-752-7755.